A terrifying encounter with a flame belching UFO on a lonely road near Huffman, Texas, resulted in appalling injuries for the three innocent victims. On the evening of December the 29th 1980, Betty Cash, Vickie Landrum and Colby Landrum had visited several small towns in the Piney Woods area of east Texas looking for a bingo game, but discovered that all games had been canceled while the clubs made preparations for the Christmas and new year celebrations. Instead they settled for a meal in a road side restaurant in New Caney. Betty Cash was then a 51 year old business woman who owned a restaurant and a grocery store. Vickie Landrum, then 57, worked for Betty in the restaurant and also occasionally as a school meals assistant. Colby Landrum, Vickie's grandson, was then 7. After leaving the restaurant some time between 8.20 and 8.30 pm, Betty drove them along Highway FM1485, a road usually used only by people who live in the area because it is so isolated. Although only about 50 km from Houston the area is sparsely populated and is covered by oak and pine trees, and dotted with swamps and lakes. It was about 30 minutes later when the three noticed a bright UFO above the tree tops some distance away. Colby was the first to spot it and pointed it out to the others. As they drove on it appeared to get larger and larger. As they realized that the object was approaching the road only a short distance ahead they began to get worried but hoped to get by it in time and leave it behind. But before they could do so the object had straddled the road blocking their way. Vickie screamed "Stop the car or we shall be burned alive!" 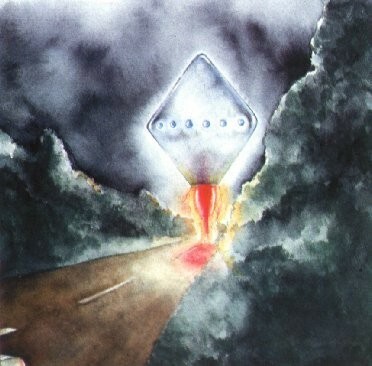 The object, many times larger than the car remained hovering at tree top level and sending down an occasional large cone of fire like a rocked blast. In between these blasts it would settle downwards some 7.5 meters or so only to rise up again on the next cone of fire. Vickie described it as being "like a diamond of fire". When Betty eventually brought the car to a stand still the UFO was only 60 meters away. It looked as if it was made from dull aluminum and glowed so bright that it lit up the surrounding forest like daylight. The four points of the diamond were blunt rather than sharp and blue spots or lights ringed its centerline. Had the UFO not come to rest over the road the cone of fire from its lowest point would have set the forest on fire. The object also emitted an intermittent bleeping sound. The three of them got out of the car to take a better look at the object. Vickie stood by the open door on the right hand side of the car with her left hand resting on the car roof. Vickie is a committed Christian who does not believe in UFOs or extraterrestrial life and when she saw the bright object she thought it was the coming of the end of the world. Because she expected to see Jesus come out of the light she starred at it intently. Colby begged his grandmother to get back in the car and hold him and after about three minutes she did so and told him not to be afraid because "when that big man comes out of the burning cloud it will be Jesus." As Vickie held Colby she screamed at Betty to get back in the car with them. But Betty was so fascinated by the UFO that she had walked round to the front of the car and stood there gazing at it. Bathed in the bright light she stood there even though the heat was burning her skin. Eventually as the object began to move up and away she moved back to the car door. When she touched the door it was so painfully hot that she had to use her leather jacket to protect her hands as she got back in the car. As the three of them watched the departing UFO, a large number of helicopters appeared overhead. As Betty said, "They seemed to rush in from all directions...it seemed like they were trying to encircle the thing." Within a few seconds the UFO had disappeared behind the trees lining the road. It was then that they realized how hot the interior of the car had become. They switched off the heater and put on the air conditioner instead. When the effects of the bright light had worn off, Betty started the engine and they drove off down the darkened highway. After a mile or so of twisting road they were able to join a larger highway and turn in the direction of the departing UFO. This was about 8 km and five minutes later. The object was clearly visible some distance ahead and looked like a bright cylinder of light. It was still lighting up the surrounding area and illuminating the helicopters. By this time the helicopters were spread out over an 8 km distance. One main group was near the UFO but moving in an erratic flight path. As they watched from their new vantage point they counted 23 helicopters. Many of them were identified as the large double rotor CH-47 Chinooks, the others were very fast single rotor types and appeared to be of the Bell-Huey type but were not properly identified. A lot of air crew members must have seen the UFO that night. As soon as the UFO and helicopters were a safe distance ahead Betty drove on. When she reached an intersection she turned away from the flight path of the UFO and towards Dayton where the three of them lived. She dropped Vickie and Colby off at their home at about 9.50 and went home by herself. A friend and her children were there waiting for Betty but by this time she was feeling to ill to tell them about what had happened. Over the next few hours Betty's skin turned red as if badly sun burned. Her neck swelled and blisters erupted and broke on her face, scalp and eyelids. She started to vomit and continued to do so through out the night. My morning she was almost in a coma. Some time between midnight and 2 am Vickie and Colby began to suffer similar symptoms, although less severe. At first they suffered the sunburn like condition and then diarrhea and vomiting. It was a miserable night for all three victims. The following morning Betty was moved to Vickie's house and all three were cared for there. Betty's condition continued to deteriorate and three days later she was taken to hospital. The burns and swelling altered Betty's appearance so radically that friend who came to visit her in hospital did not recognize her. Her hair began to fall out and her eyes became so swollen that she was unable to see for a week. The appearance of helicopters at UFO sightings is becoming a common event, and the large number of helicopters at this incident is just another link in the chain. One thing is for certain, it is virtually impossible to be mistaken about the presence of CH-47 helicopters when you are directly beneath these large and noisy machines. The evidence of all the witnesses was consistent. They were interrogated separately about both the UFO and the helicopters and all gave consistent descriptions and sketches that indicated they had seen a large number of CH-47s. Finding out where the helicopters had come from was a more difficult task than identifying them. according to a official at Houston Airport abound 350 to 400 helicopters operate commercially in the Houston area but they are all of the single rotor type, there are no CH-47s. The official also said that because helicopters fly on visual flight rules they do not have to contact the tower. 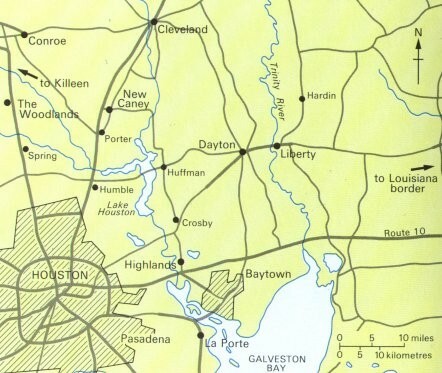 Other information provided by Houston was that outside a 24 km radius from the airport helicopters must stay below an altitude of 550 meters, and that due to a technical limitation the Houston control radar is restricted to a minimum altitude of 600 meters around the Huffman area. The US army's Fort Hood press officer, Major Tony Geishauser, told the Corpus Christi Caller that no Fort Hood aircraft were in the Houston area that night. "I don't know any other place around here that would have that number of helicopters," he said. "I don't know what it could be..... unless there's a super secret thing going on and I wouldn't necessarily know about it." All other bases in Texas and Louisiana denied they were responsible for the helicopters seen at the incident. Betty, Vickie and Colby were not the only witnesses to the strange happenings at Huffman. An off duty Dayton policeman and his wife were driving home from Cleveland through the Huffman area the same night and also observed a large number of CH-47s. A man living in Crosby, directly under the flight path, reported seeing a large number of heavy military helicopters flying overhead. Oilfield laborer Jerry McDonald was in his back garden in Dayton when he saw a huge UFO flying directly over head. At first he thought it was the Goodyear airship, but quickly realized it was something else. "It was kind of diamond shaped and had two twin torches that were shooting brilliant blue flames out the back", he said. As it passed about 45 meters above him he saw that it had two bright lights on it and a red light in the center. Since their encounter Vickie and Colby have been plagued with periodic outbreaks of skin troubles, as if they were more susceptible to infection than before. But the most far reaching injury has been the damage to their eyes. Their eyelids became infected very rapidly and have never fully recovered. Since the incident Vickie has had to have three new pairs of spectacles with successively stronger prescriptions to match the deterioration of her eyesight. Her eyesight continues to deteriorate and she still suffers from periodic infections. She fears she may eventually go blind. Colby has suffered similar problems but has needed only one new pair of glasses. Within a few weeks of the encounter, Vickie had lost about 30 per cent of her hair, and had large bald patches on her head. When it grew back it was of a different texture. Colby lost only a small patch of hair on the crown of his head, this too grew back in time. Betty's injuries seemed even worse. She experienced a severe sun burn like condition and developed large water blisters, some as large as golf balls, over her face head and neck. One of these covered her right eyelid and extended across her right temple. She also developed a long term aversion to warm water, sunshine or other heat sources. In the year following the encounter she has spent five periods in hospital, two of those in intensive care. She lost over half of the hair on her head and has also had skin eruptions, many as big as a large coin, which leave permanent scars. Doctors are baffled by these symptoms but speculate that they could be caused by some kind of radiation. One day in April 1981 a CH-47 flew into Dayton. As Colby watched he became very upset. Vickie decided to take him to the spot where the helicopter had landed in the hope that it would seem less frightening on the ground. When they reached the landing zone they found a lot of people there already and had to wait some time before they were allowed to go inside the helicopter and talk to the pilot. Vickie and another visitor both claim that the pilot said he had been in the area before for the purpose of checking on a UFO in trouble near Huffman. When Vickie told the pilot how glad she was to see him, because she had been one of the people burned by the UFO, he refused to talk to them any more and hustled them out of the aircraft. The UFO organization VISIT later located the pilot and questioned him. He admitted to knowing about Vickie and Betty's encounter with the UFO but maintained that he had not been in the area in December and had nothing to do with any UFO. Unless another pilot decides to come forward it seems that the source of the helicopters will remain a mystery.